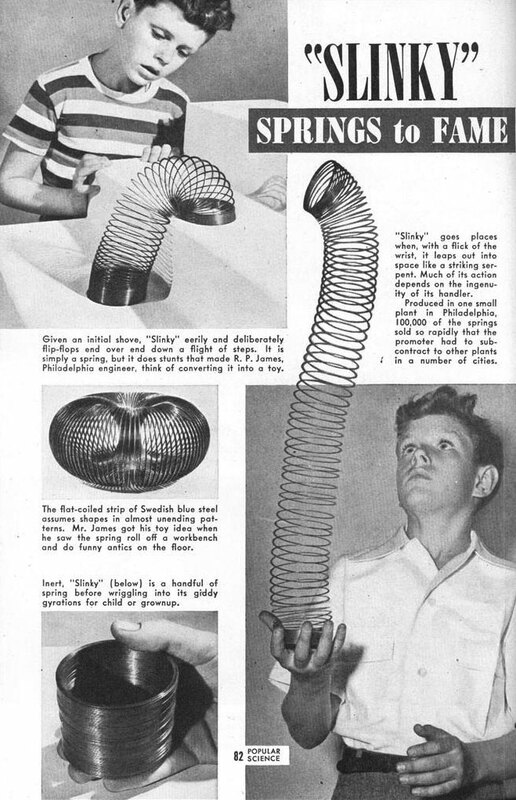 Here’s a 1946 page from Popular Science spotlighting the Slinky toy. Given an initial shove, “Slinky” eerily and deliberately flip-flops end over end down a flight of steps. It is simply a spring, but it does stunts that made R. P. James, Philadelphia engineer, think of converting it into a toy. The flat-coiled strip of Swedish blue steel assumes shapes in almost unending patterns. It was content like this that really described a product, unlike today’s periodicals which tend to cram a handful or more products onto a page, focusing solely on imagery to promote usage.